This year, the Wolves got refrigerated ice. The Ice Wolves are the hometown youth hockey team here in Dodgeville, the small Wisconsin town Lands' End calls home. And a rink of their own has been a long time coming. The association draws from a 20-mile radius. Right now, 102 kids are signed up. And it's an all-volunteer operation. Parents and volunteers do the coaching, staff the concession stand - even operate the Zamboni�! Kids are grouped by age - Atoms (under 8), Mites (7-8), Squirts (9-10), PeeWee (11-12), Bantams (13-14) and Midgets (18 and under). Kids with more experience can "skate up" with older kids - if they're good enough. On game night, the kids wander outside the locker rooms. We hear one boy intoning, "I don't have my gloves... I don't have my socks... I don't have my elbow thingies." When you play hockey, a lot of equipment needs tending after. "It takes a quarter-hour to put all their gear on, " one parent tells us. But plenty of parents are always on hand. And it doesn't matter whose kid needs help with his skates - everybody pitches in. 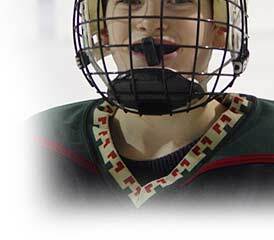 All teams are coed, with no checking (hockey talk for "body blocking") below the PeeWee level. But, as one coach sadly points out, when the checking starts, the girls tend to drop out. "The boys are bigger, faster and they hit harder," he tells us. For girls who want to continue with the sport and don't have an appetite for checking, there are girl teams with slightly different rules - no checking allowed. On girl teams, all ages play together up to the age of 19. When a coed team plays against a girl team, they play by the girls' rules. And it's possible to see a team of 12-year-old boys going stick-to-stick against high school girls a full head taller. "The boys may like that," one hockey mom laughs. The Wolves are a 3-year-old organization, but this is the first year they've had their own ice. In the past, the best they could manage was to flood the cement floor of the park pavilion and hope the weather cooperated. Sometimes it did. "We got in maybe six practices last year," one parent told us. But mostly, hockey practice meant using some other town's ice. Usually when the resident team were through with their own practice. Sometimes, that wasn't till 9:00 p.m. or later. And sometimes, the only rink available was an hour's drive away. But there was always a dedicated parent eager to make the trip. Imagine piloting a minivan crammed with kids and skates and all manner of hockey gear, rap music blaring (it's what the kids listen to nowadays) and the heater barely equal to its task. "It doesn't sound like it, but those were good times," one hockey dad tells us. Having a look at the amiable disorder as kids suit up to go on the ice, we don't doubt it. For the kids who made those late night journeys down the rural highways of our county, it's something they'll remember for the rest of their lives. Be ready when the puck drops! If you're a fan, we invite you to revel in your favorite Lands' End casual classics tastefully adorned with an official logo of your favorite National Hockey League� team. Check out the Lands' End National Hockey League Collection for MEN, WOMEN and KIDS. Planning a getaway to warmer climes? Lands' End has all the gear to outfit your personal holiday in the sun. Vivid yarn-dyed stripes impart pizzazz to our STRIPE MESH POLO. The 100% cotton piqu� fabric is knit with millions of tiny vents - a pleasurable boon when tropical breezes blow. They're not making airport concourses any shorter. Our WHEELED DUFFEL eases the weary traveler's burden. Built of tough Cordura� nylon and equipped with rugged in-line skate style wheels and PVC corner plates. For those who can't bring themselves to travel light, we have LUGGAGE in all shapes and sizes.